Aboyne Castle is not open to the public, and is situated in private parkland to the north of the village of Aboyne in Deeside. The castle dates from the first half of the 17th century or earlier, and was substantially rebuilt more than once. It is built adjacent to or on the possible site of a castle of the Bissets dating to the 13th century, and historically was well defended by marshland. Of the old castle nothing at all remains. The Bisset family, who had held Aboyne as a royal Thanage, were exiled in the mid 13th century after accusations they were involved in the murder of the heir to the Earldom of Atholl, and their lands were granted to the Knights Templar. In the reign of Robert the Bruce, the castle was held against, and captured by him, before being granted along with other parts of upland Deeside, to Sir Alexander Fraser of Cowie, Bruce’s Chamberlain. His grand-daughter was his heiress, and married Sir William Keith, the Earl Marischal, taking Aboyne with her. In the mid 15th century, the Keith heiress married Alexander Gordon, Earl of Huntly, and the estate remained with the Gordons ever since. It is very likely that a castle was built at Aboyne by the Gordons in the 15th century if the Frasers or Keiths had not already done so. Aboyne was strategically important, guarding one of the few passes north from Deeside, and all three families were of the highest noble rank in Scotland, with plenty of resources to do so. It would be usual for this to have been a substantial tower-keep with a defended courtyard, but no trace of this remains today. The castle was rebuilt in 1671, perhaps on a Z-plan with a round tower to the north-west of a rectangular hall block. However an enormous rebuild in the 19th century, and the partial demolition and rebuilding of the castle in the 1970s after it was left derelict mean this is not really possible to assess further. Today what remains is a rectangular hall-block with the round tower to the north-west, with a corbelled square caphouse. A five storey square tower to the rear with stair turrets and small bartizans is reminiscent of the remaining tower at Gordon Castle, and bears the 1671 datestone. 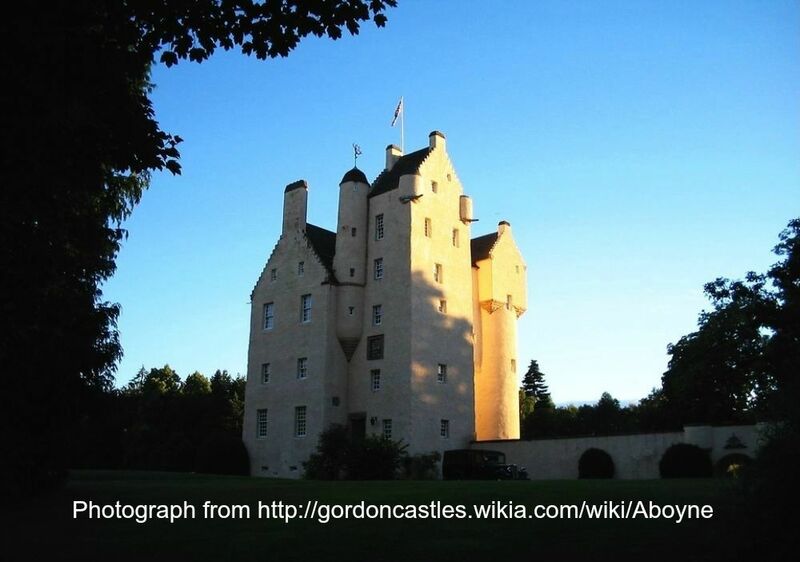 Aboyne remains the private property of the Gordon family, and is likely to keep its secrets for many years to come.